Jatropha integerrima grows as 8' trees here. In summer they are full of red blooms offering plenty of goodies for the butterflies. Princess Flower, Tibouchina... one of my favorite summer blooms. It was rainy all day yesterday and today so my photos are drippy wet for the most part. 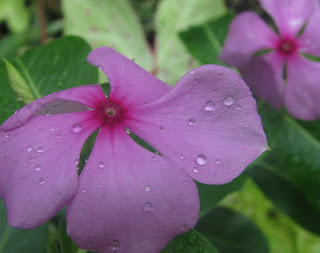 I took a couple of photos earlier this week I'm including in my August Garden Bloggers' Bloom Day. Other than the colorful and prolific caladiums we are dependent upon for spicing up the summer garden, August is typically a stressful month for flowers in my Florida garden. The long days with high temps and extraordinary humidity coupled with intermittent rainstorms leaves tender flowers wondering what to do. Looking around the garden for blooms it was thought to share for the most part what has recently started blooming. There are some standards thrown in as well if they have proven to be a good summer bloomer and not shown recently on this blog. As my camera made its way around the garden it was finding more than I initially imagined would be available to share. Impatiens are a staple all year round at Hoe & Shovel. Almost all of them coming up from self-seeding. This deep pink is one of my favorites. Every imaginable color pops up here and there. This summer they have managed to not get as leggy requiring a good pruning ... I'm supposing due to ample rain this month. Mona Lavender, Plectranthus in container pots continues to bloom all summer when trimmed up at the tips regularly. 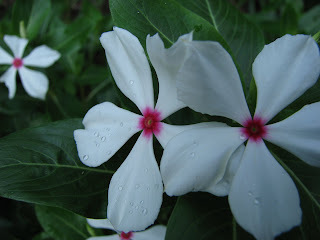 Common Periwinkle, Vinca Minor: I haven't planted these in at least ten years. The seeds must be very strong because these sweet little hardy annuals show up every August without fail. August encouraged the blooms on four cardinal flower plants I experimented with this year for the first time. I ordered six bare root plants in February not knowing what to expect at all from the cardinal flower. Those roots were so small when they arrived I laughed at them. It was a risk for me so I babied those teensy roots for all these months. What a pain! (did I say that?) They need lots of water. The jury is still out on whether to add to this collection. I'm hoping they re-seed themselves. I DO love the red! 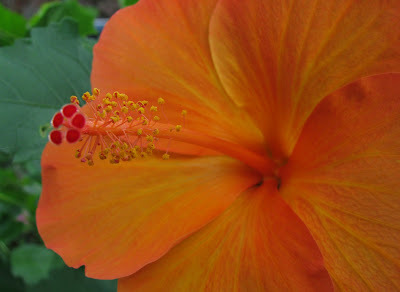 Hibiscus blooms all summer but since I haven't featured it yet this summer it is included here. Not my favorite color but it was a gift. Oooooh... speaking of gifts. I just had to share the blue ginger beginning to flower. Afterall it may not last until next month. My neighbor gave me one stalk last year. It has bushed out nicely after getting frosted by our one freezing night last winter and just this week pushed out its purply blue buds. A lone day lily decided to reappear this week. It's a bright spot among the greenery of lily of the nile and other day lilies long finished blooming. Fire bush is a summer bloomer. I planted two of these last fall for the first time. Had to cut them to the ground after the freeze but now they are attracting butterflies galore. Blue Porterweed is a subtle beauty perennial... a new plant for me this year. It is a butterfly attracter (especially zebra longwings) so I thought it a needful addition. It is shown here in the north garden behind the butterfly bush (I'm now training the butterfly as a single stalk like I learned from Frances- thanks, Frances, for the superb idea) and next to the yellow bush daisy. I've put porterweed in several places throughout the garden. 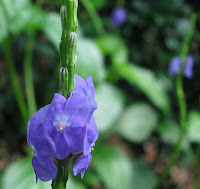 The close up reveals its tiny delicate flower of purple. I'm so happy with this new-to-me color of lantana. It is by far the hardiest of all spreading out over 5 feet wide and in the sunny spot of the SE corner it serves up nectar for all sorts of butterflies and bees. 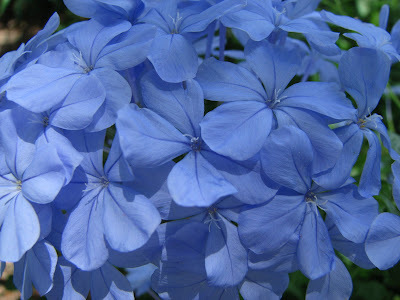 Lastly, summer would not be summer in Florida without the deep blue flowering shrub of Leadwort; Hardy Plumbago. Two large groupings of these plants are flourishing in the back gardens where there is plenty of room for their bushy habits in August. The butterflies love them and so do I for their faithful display in the hottest time of the year. Thanks to Carol at May Dreams Gardens for creating Garden Bloggers' Bloom Day. My, how the participation has increased since I first joined in the excitement last year. It is really fun to go visit as many blogs as possible to see what's growing in other gardens. Happy August, garden bloggers, and thanks for having a look around with me today. Great blooms for GBBD! I love all the vibrant colors in your garden. 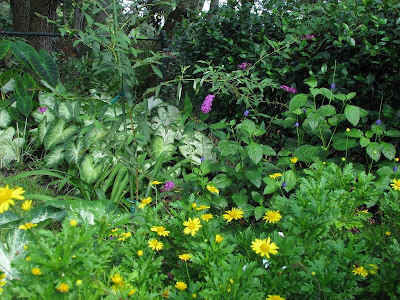 You have wonderful plants that will attract lots of critters to the garden. Hi Meems - you really did baby those cardinal flowers! They want so much water they grow in water on the edge of streams in Illinois - but what a color. 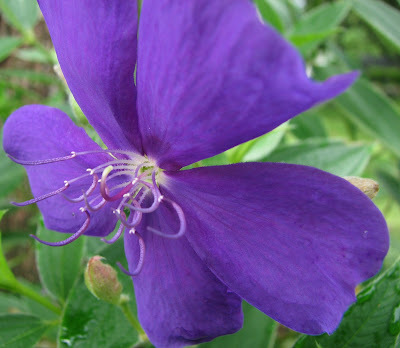 Perennial Gardener is right - your colors are all so intense - love that tibouchina. 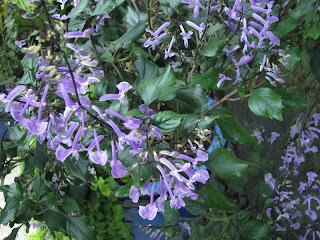 I've heard about Mona Lavender plectranthus but not seen such good photos as yours- will it be perennial for you? Faithful Blue plumbago - that's exactly the right word. wow there is so much to see and comment on. ok first of all the plumbago, i have memories of this plant either at church or in our yard and taking the blooms and putting them on my dress cause of the sticky side of them. plus i have always loved the light blue colour. the awesome hibiscus is gorgeous! i happen to love that colour! simply b-e-a-u-tiful!! the mona lavendar - i would love to see that one in person of course you know purple is my favourite all time colour in any way, in any thing, interiors and definitely in the garden. wow this fire bush is so colourful and unusual-love it! i am with you on the cardinal plant i love red and this is fun with all the little blossoms! the blue ginger blooming-what a treat! i don't know why but seeing these during this hot dry period here has been uplifting. thank you for sharing your lovely august blooms. i liked that they were wet, too. beautiful! They're quite good at close-up photography. It isn't possible to do that with my camera. Meems, you've got so many gorgeous plants! It's so nice to get a look at all your exotic plants (which we can't grow here in Sweden). For example that blue ginger...wow! Your garden blooms are a wonderful combination of hot and cool! The blues, while intense, are a good balance to those hot steamy colors of cardinal flower and hibiscus. It's always a treat to visit, you have a writing style that makes me feel I am right there in the garden with you! What I noticed is that most of your flowers are in bright saturated colors. I love that, but especially the blues of the Tibouchina, the Ginger & Plumbago. I love the Tibouchina. The colour is spectacular. The Porterweed is really pretty and the Cardinal Flower striking. A wonderful Bloom Day post! perennial gardener: Thank you. The critters and crawlers are certainly plentiful. They must like the heat and humidity as they are out in full force. Annie: I've had the mona lavender since February. It has bloomed continually as I have clipped the tips off. It will be interesting to see if it acts like a perennial like so many other annuals do here. Those cardinal flower has loads of buds on it but since only 4 out of the 6 I bought made it, they still look a bit insignificant... I'm really not sure what I'll do about them after they bloom. They are planted in a low area but still hand watering is necessary... too much work. marmee: the plumbago was at home in the backyard behind the laundry room. Those blooms do stick and they get on me still whenever I get around them. 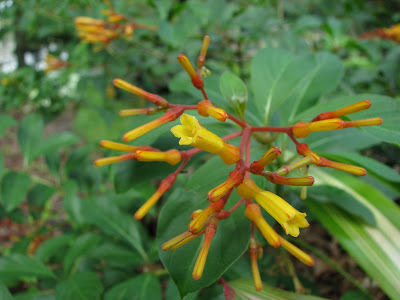 I am partial to the firebush too. A tree limb fell on one of them in the rainstorm yesterday ... broke a couple of branches but damage not too major. They are planted in the very back with bromeliads planted at their feet. Cheryl: Thank you. The bright colors are great in summer. You and I definitely have opposite challenges. The cardinal flower is supposed to need lots of moisture and I knew that upon taking the risk to plant. It is also supposedly okay in full sun or partial shade. Good thing I didn't put it in full sun as first intended... even in the partial shade it gets wilty unless well watered.Do you stake the cardinal? Ewa: Very different climes we garden in. 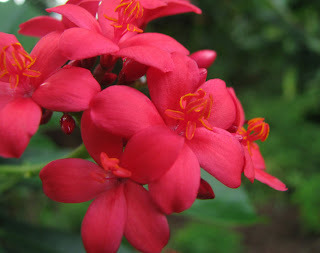 I can't imagine my 8 -10' Jatropha trees as an indoor plant... but a lot of folks around here grow them as shrubs. To my asian visitor... thank you! Katarina: Hello.Thank you. I am SO excited about the blue ginger and SO grateful to my neighbor for always sharing with me. Susie: Maybe it's not too late for your ginger... I suppose it could still show some blooms by the end of August. If not, next year for sure! Gail: Thanks so much for coming along in my garden with me. I don't suppose there is a color in the garden I don't like all together. There is room for them all... somewhere. MMD: After I put the post together I realized the same thing... the blooms at this time of year have to be sturdy to make it in our heat. I think I'm with you on the blue hues... these happen to be fairly intense. Kate: Good to see you. Thank you. My neighbor has a Tibouchina "tree" that stands at least 15 feet tall covered with blooms... just breathtaking. I'm really enjoying the porterweed... it will bloom for many months and drop seeds for more plants too. All the variety is such a treat. I enjoy coming here to see all your different blooms, but there are a few I see that even grow up north. The lantana is the brightest color I've ever seen! I love it, but I use it only in containers. The leadwort is lovely; I thought it was a hydrangea at first. Thanks for visiting and identifying the caladium for me! Gorgeous blooms! I have most of them in my garden too but they dont look half as photogenic as yours. 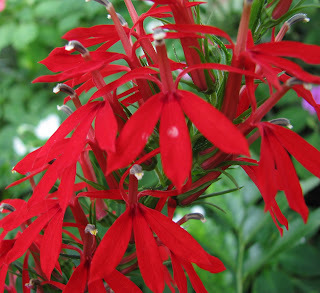 The Cardinal flower is new to me, though. Arent lantanas gorgeous? They grow wild here and have all the butterflies dancing over them. Then when the berries form, all the birds come calling. mother nature: I appreciate that you like the variety... thanks for stopping by. rose: I adore hydrangea but none grow so well here. I am trying oakleaf this year and so far so good. So, yes, the plumbago bloom is my pseudo-hydrangea with its many flowers unfolding into one. 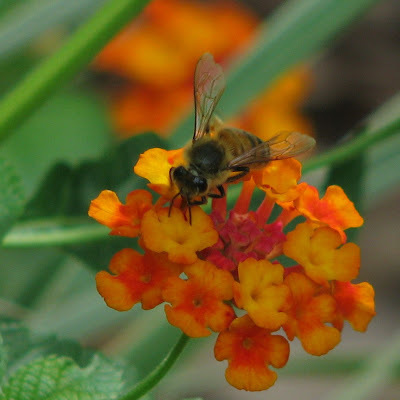 Lantana grows wildly in woodlands and street-side here. Certain varieties do better than others ... this deep orange red one feature here has proven to be the best butterfly attracter. 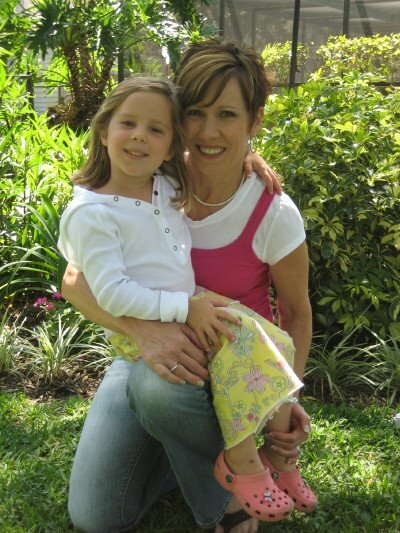 Sunita: Thank you and welcome.Yes, I am a big fan of lantana and have every color growing in my garden. It's been my experience that the lavender and white don't bloom as well in the midst of summer... they prefer the cooler months but when they do bloom they are prolific... I use them as ground cover. Wow, what a beautiful show. Your photos are lovely. That hibiscus is a show stopper. What color! Many of your plants I've never seen. 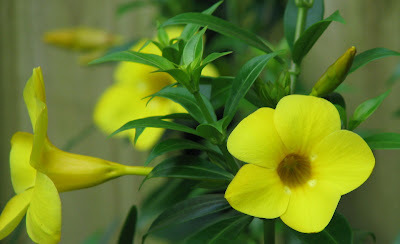 So interesting - would you believe the only plant I'm familiar with in this post is the impatiens? Amazing what different things you are able to grow "down there". Hi Meems, you have so many beautiful blooms! I recognized the Tibouchina right off this time. I realize we have them this year too at the nursery, they just haven't bloomed. Now I recognize the foliage. Love the Mona Lavender, the blue ginger, and that gorgeous cardinal flower. I've thought about trying cardinal flower at the edge of the bog we have now that our neighbor's weeping willow is gone. Everything looks gorgeous, in spite of your heat. We've been having internet problems here since a storm a couple of weeks ago - coincidence since you lost a comment on my blog, and I lost one here a couple days ago, when once again the internet went down. It's up for now, but has been up and down all day. Hopefully it will be up long enough to finish this long comment! Speaking of storms, I hope you and your family are safe and don't have any damage from the storm down your way. I'm thinking of you this evening. Marnie: Many thanks for stopping by. It is so interesting to me to visit around on GBBD and see so many plants and flowers I've never seen either. 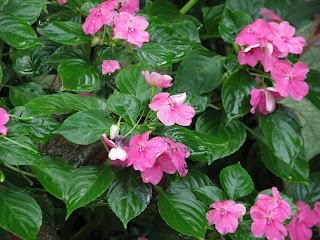 Amy: Impatiens is one of those universal plants it seems. Most of the colors in my garden have come up from the plants dropping seeds and making new colors. They crop up everywhere and grow all year long. Linda: Thanks ever so for your kind words and well wishes. I feel certain our area will avoid most of the trouble with Fay. I've posted the latest on it tonight. Cardinal Flower would most likely do quite well in your bog... it is the condition they prefer. Hope your Internet issues are behind you. Hi, I found your blog through another. I love all your photos and plants! I am also a gardening lover. 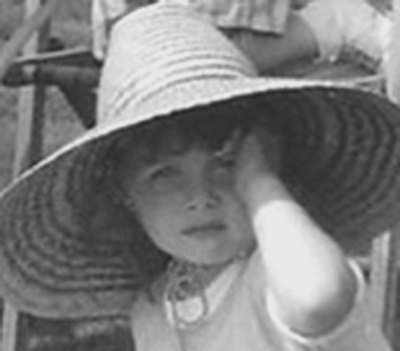 anne fannie: Welcome and many thanks for stopping by and kind words. Come back anytime. s/s/m: Thank you. It is one of my favorites as well. There are two of these in the very back. Planted there for its sunlight requirements but I have to be gardening (which isn't really an issue is it? )to fully enjoy them they are so far in the back. I like these bright tropical colors. It's a great showing on a hot, steamy day!